All the major stats and numbers recorded during the final ODI between Pakistan and Australia. Australia completed an ODI series whitewash against Pakistan who can be considered as a 2nd string side due to resting key members. In the 5th and final ODI, the likes of Usman Khawaja (98), Aaron Finch (53), Shaun Marsh (61) and Glenn Maxwell’s 30-ball 70 helped them to finish with 327/7 on the board in their 50 overs. Haris Sohail fought hard in the run-chase with a near run-a-ball effort of 130. However, his century wasn’t enough for Pakistan to avoid a whitewash and made only 307/7. 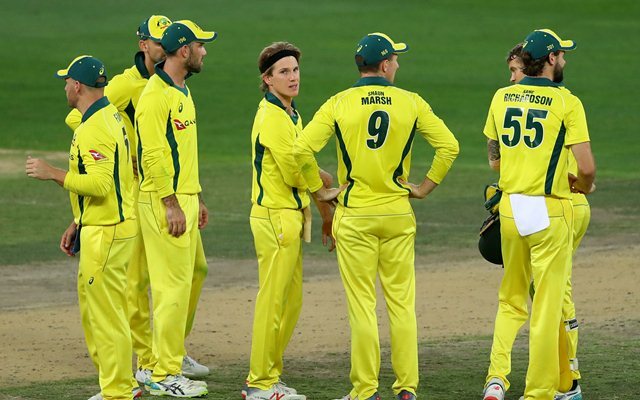 8 – For the first time in their ODI history, Australia has won eight consecutive matches in the Asian continent, a streak that began from the 3rd ODI against India. They won seven in a row during 1998 in Asia and also seven on the trot between 2003 and 2004. 6 – Pakistan’s innings is only the 6th instance of an unsuccessful ODI chase despite two century partnerships. The last of the previous five such instances were recorded by Sri Lanka against India during the 2009 Rajkot ODI while chasing 415. 3 – Only the 3rd time Pakistan lost an ODI despite two pairs sharing century stands. They fell five runs short of India’s total of 349 during the 2004 Karachi ODI and also lost to Sri Lanka in the 2014 Asia Cup final despite two century partnerships. 3 – Each of Australia’s top four batsmen scored fifties in this game; the 3rd instance of Australia’s top four scoring fifty-plus in the same game. The 2006 ODI against South Africa in Johannesburg and the 2013 Jaipur ODI against India witnessed the Aussies’ top four scoring 50 and more. 327/7 – Australia’s total of 327/7 in this game is their 2nd highest total in the ODI format in the UAE. The highest ODI total of the Aussies in the UAE is 332/3 which came against Sri Lanka during the 1990 Sharjah ODI. 451 – Aaron Finch became the first Australian to aggregate 400+ runs in a 5-match ODI series. His tally of 451 runs is the joint 4th most by any player in a 5-match ODI series. Overall, the 451 runs scored by Finch are the 2nd most by an Australian in any bilateral series. George Bailey scored 478 runs across six innings during the 2013 series in India. 2 – Haris Sohail scored two centuries in this series and both the knocks ended up on the losing side. These are the joint-most hundreds by any player in an ODI series/tournament that came on the losing end. Among Pakistan players, Inzamam-ul-Haq scored two during the 2004 home ODI series against India while Mohammad Rizwan also had two tons in defeats in this series against Australia. 5 – All the five individual centuries recorded for Pakistan in this series came on the losing side. These are the joint-most number of individual centuries for any team in losing cause during an ODI series/tournament. India also had five such tons during the 5-match ODI series in 2016 against Australia. The Australia-India ODI series in 2016 witnessed seven centuries including two from Australia that resulted in defeats which is the only other bilateral ODI series with 5+ tons in the losing cause.